This well presented property is located on a quiet residential style complex located in the popular village of Chloraka, which has a wide range of local amenities. Paphos, the coast road and local beaches are a few minute’s drive away. The property is very well maintained throughout and includes a refurbished modern kitchen, stylish shower room and guest WC. To the front of the property is a private driveway leading to a covered parking area with three large storage units. To the rear is a delightful low maintenance private garden and large covered veranda, ideal for al-fresco dining/entertaining. An outdoor kitchen/BBQ can easily be added if required, as plumbing and electrics are already in place. This lower floor space also has great potential to convert into a fully self contained studio apartment. Steps lead up from the driveway to the front entrance. The living accommodation features a spacious open plan living room with cosy lounge, formal dining area, well equipped, modern kitchen with breakfast bar and separate guest W.C. Sliding patio doors from the lounge lead out on to a spacious terrace with fabulous panoramic sea and mountain views, making this a perfect spot to watch the amazing Paphos sunsets. Off the kitchen is a good sized balcony with views of the surrounding countryside and mountains beyond. On the first floor are two spacious double bedrooms with fitted wardrobes and air conditioning, plus a contemporary style shower room with fitted vanity unit. The master bedroom benefits from direct access to a private balcony with stunning views of the perfect blue sea and beautiful coastline. 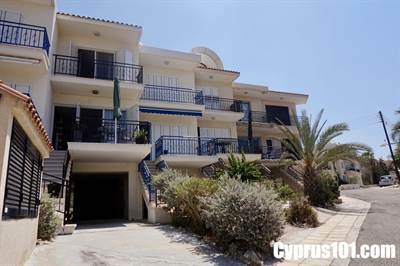 This townhouse for sale in Chlorakas is ready to move in with much to offer and due to all it’s extras and additional potential, is certainly suitable as a permanent residence or holiday home. It comes fully furnished and there are full title deeds.